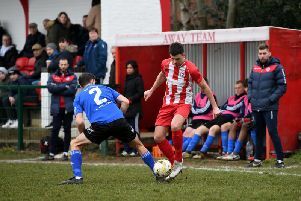 Billy Roberts and Ben Walsh netted for the home side against a lone reply from Henry Sne for the Premier Division supported by Sportsform leaders. All of which was good news for second place Cranfield United who, with a 3-0 home victory over AFC Oakley M&DH, sit nine points adrift having played two games fewer ahead of the two clubs going head to head next weekend. Courtney Boughton netted twice and Connor McBrein once to do the damage. Now in third are Crawley Green Reserves who returned to winning ways on the road with a 3-1 victory at Wootton Blue Cross. Tim Akerele, Adam Marsh and Liam McGovern saw their goals only replied to once by Chris Harvey for the Blue Cross who they duly leapfrog in the table standings. Whilst fifth place Ickwell & OLd Warden were beaten for the first time in five outings when losing 5-1 at Riseley Sports who were chalking up their third home win on the bounce. Jay Willett with a brace was joined on the Sports scoresheet by single goals from Josh Poole, Mitchell Crook and Lewis Donald to bring up the nap hand against a lone visiting reply from Scott Alleyne. 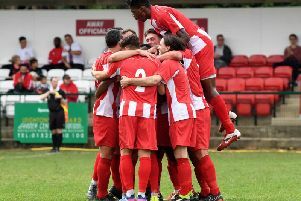 For AFC Kempston Town & Bedford College in was a first league win in nine outings and an end to their six game losing run with a 2-1 victory at Queens Park Crescents. Bradley Temperley and Anas Bechkoum were on their scoresheet against a lone Crescents reply via Fabio Sattar. This victory lifted the Town out of the bottom three at the expense of Caldecote who have now lost their last nine league outings after being beaten 4-2 at home by Marston Shelton Rovers who are now unbeaten in their last seven starts. Harry Baker, Carl Borremeo, Ben Lawrence and Dean Clark scored for the Rovers goals against home replies via Jack Boyd and Harry Lovely. Flitwick Town returned to winning ways with a 5-4 home victory over Wilstead. Dan Stafford and Dave Keefe with braces plus an own goal brought up the home nap hand against Wilstead replies from Kevin Butler, Lee Reynolds, Ranvir Thiarra and Shaun Winconek. Bedford Albion remain six points clear at the head of Division One supported by O’Neills and unbeaten on the road this season after winnning 6-0 at Sandy for whom it was an eighth defeat on the bounce. Paul Babbington and Kegan Roberts both netted twice to go alongside single goals for Jonti Neal and Adam Lewis. Whilst, with Cranfield United Reserves sitting the afternoon out, in second place now are Biggleswade FC Reserves who are still unbeaten on the road this season and in their last 10 outings after winning 6-1 at AFC Kempston Town & Bedford College Reserves. John Veal, Kyle Jeffery, Ollie Lee, George Riley, Oscar Smith and Ash Boness all scored against a lone Town reply from Martin Prowse. Just a point behind these two sides are fourth place Wixams who ran out 4-1 home winners over Flitwick Town Reserves who have now lost their last six away games. Gaz White and Adam Jellis both netted braces to do the damage. Fifth place Shefford Town & Campton Reserves shared the spoils in a 2-2 home draw with Cople & Bedford SA. Jack Dryer and Ryan Dobson were on the Town scoresheet against SA replies via Ollie Hughes and Akeem Lendor. Sixth place Henlow were 2-1 home winners over Christians in Sport (Luton) where Luke Hills and Shaun Faulkner were on the mark for the home side against a lone reply via Adam Oilver. Also winning on home soil were Lea Sports PSG who are now unbeaten in their last five outings after beating Totternhoe Reserves 3-1. An own goal plus strikes from Conner Napper and Rob Hennem were replied to once by Joe Dixon for the visitors. However, life was good on the road for The 61 FC Luton Reserves who ended a five game losing away run when winning 3-2 at Wilstead Reserves who were duly losing their first home game. Ashley Prospere with a brace plus a strike from Reece Gouldbourne were replied to by an own goal plus a strike from Tom Dunne for the home side. There is no change in Division Two supported by Hy-Pro following wins for the top three clubs. For current leaders Houghton Athletic it was a retention of their unbeaten home ways and an extension of their unbeaten ways to 10 games with a 2-1 victory over St Joseph ( Saturday) thanks to a brace of goals from Jordan Thomas against a lone St Joe’s reply from Glen Marshall. This victory keeps them two points ahead of second place Elstow Abbey who have played two games fewer and remain unbeaten after netting a 1-0 home win over Kempston Athletic thanks to a strike from Glenn Tumulty. For third place Meltis Albion it was a return to winning ways on home soil in defeating M&DH Clapham Sports 8-1. Niall Cavavan with a brace was joined on the Albion scoresheet by single goals from Jordan McGoldrick, Stanley Gonese, Fabio Espesito, Aran Wright and El Medhi Enniduachi against a lone Owen Franklin reply for the Sports. Whilst also hitting eight goals were Clifton in an 8-1 home victory over Marston Shelton Rovers Reserves. Charlie Watson led the way with a hat-trick, Ryan Parker scored twice with single goals coming from Dale Houghton, Joe Worboys and Kyle Davis against a lone Rovers strike from Lorenzo Jordan. However following five straight home defeats AFC Oakley & MD Reserves made full amends an with a 13-1 rout of Unite MK Reserves. Joe McDonagh led the way with five goals and Ray Patrickson grabbed a hat-trick with single goals coming via Jamie Endersby, James Grandidge, John Hislop, Pady Enwright and Marcus Blackhall. Mohammed Ismail Raja on the MK scoresheet. Also enjoying life on home soil were Black Swan (Luton) in beating Luton Leagrave AFC 5-2. Joe Grossi, Danny McGovern, Callum Wilson, Joe Attipa and Frankie Johnson all finding the back of the net against AFC replies via Niko Covileac and Hartley Coleman. Atletico Europa climbed the table into fourth after winning 3-2 at Caldecote Reserves to extend their unbeaten away sequence to six games. Paddy Alimanji with a brace and a single goal from Robel Hailu outweighing home goals via Carl Heath and Martin Chappel. The Pines (Luton) are still 100% for the season and 14 points clear in Division Three supported by Hy-Pro following their 4-0 victory at Shefford Town & Campton A where both Ben Harris and Alan Morris netted braces. Whilst for second place FC Polonia (Luton) it was a 4-2 victory at Lidlington United Sports. Patrick Falkowski with a hat-trick and a single goal from Grzegorz Rudnicki were replied to by United goals via Tom Staples and Mark Reynolds. For third place Real Haynes it was only a share of the spoils in drawing 2-2 at Wootton Village. Jonnie Lam and Ben Hall were on the Village scoresheet against replies via Josh Brown and Tyler Winter. Alas for Real Haynes Reserves it was a 6-0 home defeat by Wixams Wanderers. Tom O’Neill with a hat-trick was joined on the Wanderers scoresheet by single goals from Gavin Cheema, Joe Holmes and Craig Brown. Also hitting six goals were Stevington Reserves in a 6-0 home win over Flitwick Town A. Dom Marino and Jamie Daniels both netting twice to go alongside single goals for Regam Scott and Fabio Cammarano. Whilst Harlington Juniors’ seven game winning run was ended when beaten 2-1 at Square FC who were ending a four game losing run. Harry Stapleton-Charter and Kevin Beales on the home scoresheet against a lone Alex Frantellizzi reply for the visitors. For Thurleigh it was a 6-1 away victory at Sporting Lewsey Park. Alex Horn with a brace marked their scoresheet alongside an own goal plus strikes from Ethan Potts, Dan Curran and Issac Jones against a lone Park reply via Luke Lincoln. They will now face CS Rovers in the final after they netted a 3-2 home win over Sundon Park Rovers. Connor Darocha netting twice and Daitso Chibwe once against replies via Ben Pincher and Courtney Francis.